France. All abris must conform to AFNOR standards - Norm NF P90-309. obviously kept to a minimum. Other covers or security are not required. Abris can be constructed in a matter of hours - but do require planning permission. extra large construction in glass. priced, its main advantage that it has no tracks and is easily operated. for easy stowage behind the pool. the advantages of trackless movement of each module while also keeping a low profile. - abri cost 14768,21 + delivery and not including installation. delivery and not including installation. Abris can be self installed if required. standards, no further pool security is required in France. 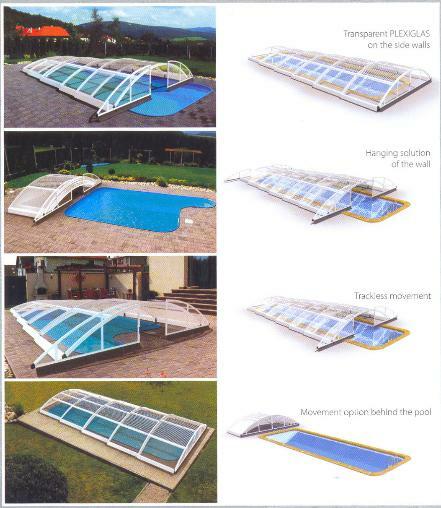 The abri cover must be replaced and the door locked on leaving the pool.